The most important aspect of growing bugs for food is their price. Arguably if they were extremely cheap it would give dramatic incentive for people to find more uses for them. So this is what we should be discussing. Use very large thick black garbage bags, such as those used for leaves in the fall time for the Mealworm culture. These arguable increase efficiency and reduce cost dramatically as they have a nearly liquid behavior allowing the entire surface to be used without wasted space you'd get from plastic boxes. This means if you have exactly 5ft^2 to work with, you will be able to use exactly that much for production instead of trying to awkwardly fit the max number of expensive plastic totes in the area and potentially leaving many inches or feet of unused space. Additionally they can be as thick or as thin as you want and no vertical space will be wasted either if shelving were made properly. They will of course be filled with the substrate and left laying. It is also important to find the best material to grow them on. Arguably wheat bran and opuntia cactus or other cactus is the best option. Wheat bran is approximately $200 per Ton and opuntia cacti are easy to grow and available to nearly everyone in the Americas. Likely another cactus like plant, if not opuntia, is available in other places such as China, Africa, Australia, etc. This is cheaper than carrots as it requires far less care and propigation is easier. Does the depth of substrate negatively or positively effect yield? Does rotating or agitating the substrate fix this problem? If it could be a foot deep before needing to add shelves for another container (expensive!) it would very important to know. Imagine the production potential and low cost of a 1ft x 5ft x 5ft area! Is a mixture of high oil content rice bran and corn meal cheaper or higher yielding than just wheat bran alone? What particle size is ideal? Does it effect turn over time from beetle to larvae to beetle? 3. Do mealworms chew through large thick garbage bags? 4. If depth of substrate negatively effects yield, is it because improperly distributing the moisture providing cacti? 5. What is the ideal size of cactus cuttings to put in and at what ratio per amount of substrate? We should each assign ourselves one of those variables and write out how we are going to scientifically perform expirements to find the ideal solution, share them with the community and look for ways to improve the expirement. Then at least two different people should perform the tests. I would be happy to do some, but it is winter and I have little money. Expect me to do some expirement in the summer. Additionally the bag idea has incredible use and potential for Super poor countries. They may not be able to easily protect their Mealworm farm against mice who can get into the best of plastic containers, but they can surely/probably hang a bug bag from a rope and a tree that protects it from mice. Assuming birds aren't opening the bag with their Beak, etc. Or better yet, if possible just add water to the waste material and then raise black solider fly larvae on it if this is a good possibility? Then the waste product of the BSF could be used as fertilizer. I'm not following on the plastic bag thing. Are you talking about lining a shelf with plastic or actually talking about a plastic bag? A fabric formed container would certainly be cheaper, but for access, it would be best to set it up like a shallow box, maybe 5 cm tall. There is a relationship between surface area and volume. You want more surface area, and bags are not a good solution for increasing surface area. Corn meal is not cheaper than wheat bran, and rice bran is available only in specific areas. I think wheat bran + cactus would generally be appropriate in the vast majority of areas. I would suggest that we research each point in detail, first, to determine if tests have already been done. In the case of substrate depth, I'm sure that has already been tested. I have optunia cactus growing here naturally, and there are a wide variety of species to choose from. The best, of course, would be the spineless, domesticated variety that is grown for human food. Cactus have more water than carrots, so you'll probably need less of them. I wonder if the waste material is palatable or useful for other species, like chickens or BSF or even earthworms. No bags are great for surface area as a large garbage bag can lay flat on ground sideways, (but have the opening upwards at one end to hold in the contents) with only a few inches of substrate in it. Could also have the dimensions of 35 x 3 x 53. With opening 5 inches folded over to prevent escapes and spills. That's a container 35 inches by 53 inches with 3 inches of depth for pennies. Also yes the waste is great for Earthworms so I have read. ok, so you'd need a shelf to keep it flat like that. Respiration might be limited, as well, not sure how that works. Do you imagine the whole top being open, or just one end or what? It would need a structure to hold it in that position, so you'd need a box or at least a wire frame to drape the plastic over. In this way, it's just a liner, and a cheaper route would be builder's plastic, which is thicker, I think it's 6mil black poly. It comes in rolls that are 6m wide. You could make simple shelves/frames with wire mesh and PVC or even wood. 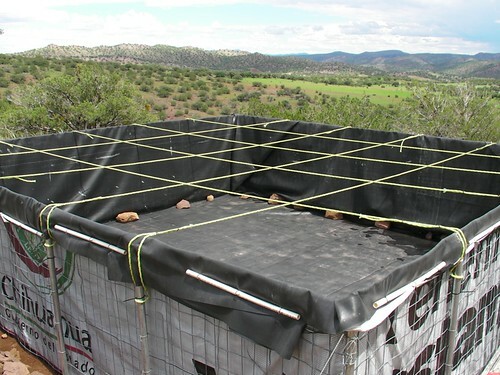 Chicken wire is cheap, and could serve as the structure under the plastic. Wood (or bamboo) stringers for the sides would be best, so you can staple the wire and plastic to the wood. Window screen might be another option, especially for adults, so that eggs and larvae can fall through to a growing tray below. Your design could be something similar, but on a smaller scale. You could literally make them up to 6m long with VERY cheap using 6 mil construction plastic. Why would it need a box or any support? what holds the shape? without a shelf, it won't lie flat. And without something to prop up the sides, the mealworms just crawl out. Plastic won't hold itself up. the advantage here is that the structure can be very inexpensive, like mesh. Q: what holds the shape? If you have a bag that is 35 inches wide and 53 inches long, and put 5,565 cubic inches of wheat bran in it - it can't expand any further than 35 inches in one direction, or 53 inches in the other direction, so it will become 3 inches deep. "without a shelf, it won't lie flat." The floor is the first shelf, and if you discover you need another layer, a shelf would be easy to improvise with ply wood and few bricks. But really, a 5ft by 5ft area of these bags that are 3inches deep could yield something like 48 pounds of mealworms. If you then put a cinderblock or something, and ply wood on top, you could then fit another 5ft x 5ft area to produce another 48 pounds of mealworms. "And without something to prop up the sides, the mealworms just crawl out. Plastic won't hold itself up." The opening of the bag would be on the side of it, not the top - you would just leave extra room and fold the sides upwards and over onto the bag. Maybe use a little bit of tape or a small weight to hold the flap down. This could be done in a way that allows for good air circulation, or just poke small holes in the top of the bag. "But really, a 5ft by 5ft area of these bags that are 3inches deep could yield something like 48 pounds of mealworms"
in how much time? according to the figures I have, you would need a year to produce that amount from that surface area. But, the idea is solid, a flexible container to hold the colony. Trash bags are good, if you need to go bigger, go with 6 mil construction plastic. Though I still think you need some sort of structure to keep the top plastic off the substrate to allow for air circulation, otherwise the plastic just sits on top of the substrate. I think home production is great, but the next scale up is growing for you and your neighbors, and that's the kind of scale that needs some cheap options for producing in bulk. For a kg or 2 a month, no, you don't need anything fancy, your bag might work, but for something that can produce food for even a few people, you'll want to start thinking about low cost, but also high efficiency. Wire shelves with a plastic liner would be perfect for that kind of scale. The trash bag is a similar thing, just smaller scale. I think the floor is fine, but I could see a very simple large tray system being created that would be low cost, easy to make, and could scale to very large sizes. I'm thinking of mealworms as food for animals, specifically chickens and pigs, so growing on a larger scale without expensive containers becomes possible. "in how much time? according to the figures I have, you would need a year to produce that amount from that surface area"
Based on water calculations? Do you have a source that says what the limiting factor is? "Based on literature review, an optimal density of 2-2.55 larvae per cm² was indicated. " That's from a couple of studies that tested density. Where did you get your figure that 25 square feet could produce 48 lbs of mealworms? We really like the concept of using bags to help manage insects, and we've been exploring similar ideas for kits at the smaller end. Where our thoughts differ are when considering what sort of bag. If we can find an inexpensive, unchewable nylon mesh that is fine enough to prevent mealworm escape whilst still permitting frass, it could be used to simplify the harvesting process. Imagine a flat bag of worms sitting in a wire or plastic shelf, with frass falling straight through the nylon for collection underneath. It just takes some manual excitation to sieve out the frass, leaving you with just worms and feed (or just worms, if you spend the last few days purging). We've tried this and it works pretty well. This would be great for a small, "toy"-level kit, since you don't have to spend much time messing around with separation, and you don't have to touch the worms if you're squeamish. You could even throw the bags in the laundry between cycles. We're not sure whether it would make much sense at scale, though - it'll add expense and complexity for not a great deal of convenience. It would definitely be nice to haul out big sacks of worms rather than dealing with the worm/feed mix as a 'fluid', though. For a genuinely significant scale, I really like what you guys are starting to hit upon. Imagine using plastic sheeting, nylon, tarp or another fabric-like material as the "shelves" of racks, suspended in a simple metal/wooden frame. Almost like "bunk hammocks" on an old Navy ship. Here's the feline equivalent. They could either be open, like that cat hammock, or closed over the top (if sufficiently porous). We've had a lot of trouble trying to find commodity trays that are genuinely cheap enough to consider for use in the developing world; rolling your own out of plastic sheeting is a great idea. They'd need to have steep enough sides to prevent worms crawling out, but that wouldn't be tricky. If they were detachable from the frames, they'd be super easy to clean and might make handling the insects easier at harvest time. 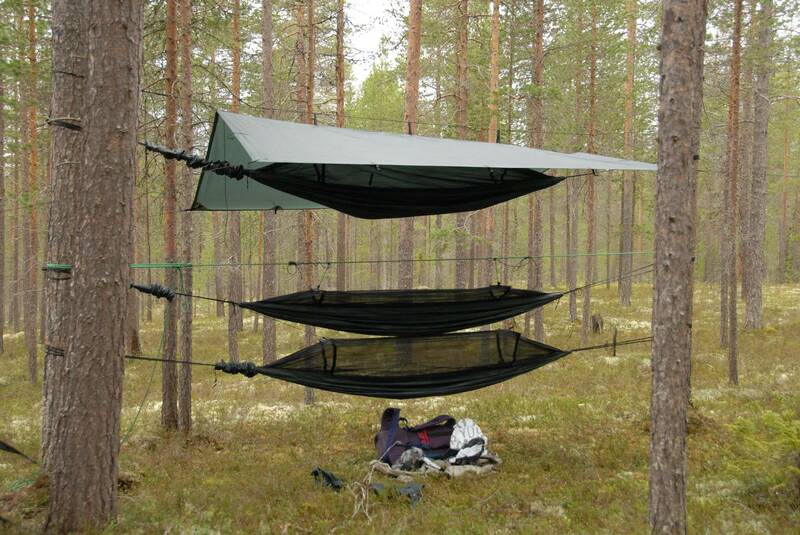 You might even be able to stack them between two posts, like these hammocks. A big win there would be the ability to fit an entire farm in a small cardboard box and ship it anywhere in the world. If we could use commodity sack cloth or mosquito net it would be a big win for the developing world. @Vesp, an issue with using bags in the way you've proposed would be airflow. Without any ventilation, it'll be tricky to get enough oxygen in, and carbon dioxide and water out. Since mealworms aren't great escape artists, it's probably easier to leave the entire top surface open to the air. If you're doing this indoors, you shouldn't have to worry about hungry passers by, but if open to the elements you might have to do some smart pest management - enclosing the entire operation in mosquito or bird net, for example. netting is an interesting concept. What size mesh is required for frass to fall through? I was thinking that a screen bottom would be good for adults, as well, and then eggs and larvae could fall to a box below. billboard vinyl might be another cheap option. 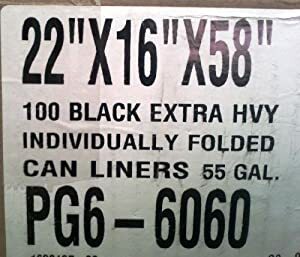 We use them for liners and different projects around here, and they are very cheap or free. They are extremely strong, and something like the cat hammock would be easy to make. Even just a wood frame with the vinyl stapled to it would make for a quick, cheap and long-lasting tray. Hmm so what is the ideal depth? Since depth is an issue, wouldn't we want to use something like sheets of cardboard alternating between egg cartons stacked skyscraper style with only a few cm of wheat bran between them? they may eat the cardboard, but it is easier to have trays that are removable that something that stacks on the layer below. 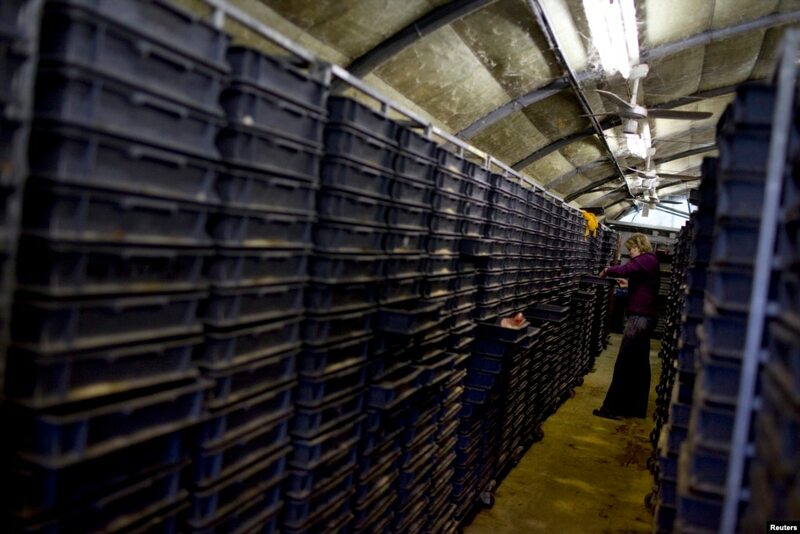 Commercial mealworm farms have trays that are on shelves that go to the ceiling. Typically, the trays are a few inches deep. @VelaCreations we're using a fine strainer mesh (mosquito netting) in our prototype. The frass particles are quite small, even from full grown mealworms, just microns. We like this very fine mesh because it serves very well to keep any other pests out of our mealworms as well as serving to filter their frass, but it may not be cost effective at a larger scale. The general motion of the worms in the bag agitates the contents enough to passively sift the frass out of the bag, so we still need a tray/shelf/sheet of solid plastic beneath the bag for waste containment. @Vesp the general consensus we've found in our background research is that a few cm (2-4) depth of bedding substrate is preferred. We have raised mealworms in a little as 1cm and as much as 4cm of bedding. My opinion from our direct experience is that ~2cm is pretty ideal. The worms generate enough localized heat via friction as they move around that they can't be stocked too densely/deeply or they will overheat and die. Because of this constraint, I feel it is probably best to develop habitats as single layer planes that can be stacked fairly closely with just enough room for airflow. As an interesting note, we have seen some of the "state of the art" in mealworm production that are stackable trays about 18"x24"x4", with screened holes along the sides, above the level of the bedding. 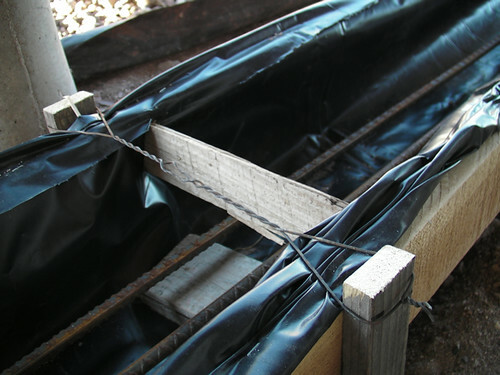 These trays can be stacked quite high, and have enough cross ventilation that they pretty much seal on top by stacking. However they must be quite expensive to produce and require quite a lot of manual labor to stack/unstack/restack for normal management. - Heavy, bulky equipment. A single plastic drawer isn't much, but a lot of them quickly add up and make it difficult to ship farm equipment to where it is needed. Transportation costs can make a huge difference in the developing world . Contrast this with the elegance of silkworm rearing in India, where the caterpillars are raised on simple, open shelves, fed with whole branches of mulberry, and their natural tendency to climb onto fresh food is exploited when their habitat needs to be cleaned. An interesting idea popped into my head: 'stacks' of mesh bags or fabric trays, suspended by rope from either side and designed in such a way that one side of the stack can be dropped down during harvesting, causing the contents to fall into a collecting bucket. could we get mealworms to climb to new food? or maybe to self harvest, like BSF? I could this working with a ramp and fresh bedding+veggies in the new bin. I don't know if they would all follow or not. We've done some experiments trying to "herd" mealworms with food placement. Although the worms flock to the moisture sources, in our experience they also disperse fairly quickly after getting their fill. Although we haven't experimented with ramps, a cleverly enough designed one-way path to the moist food might be able to coax the mealworms to self harvest. It would remain to be seen if it were efficient enough to rely on in place of mechanical separation techniques like sieving or air separating as we have more successfully experimented with ourselves in the past. This sort of technique might be quite effective and useful with crickets or caterpillars. We've used a similar approach for moving around silkworms. just letting the mealworms move and sift the frass is an improvement, really. I worry that eggs and newly hatched larvae might be able to fall through a screen, so maybe we need a nursery tray until they are big enough. What other mealworm behaviors could be used to reduce labor? Yeah, I think you're right that they'll need a nursery until they're a certain size. The nice thing is that they take up less space when they're little, so a relatively small nursery can serve a relatively large farm. Also, when it comes to laying, only a small portion of each cohort will make it as far as pupation - the rest will be harvested and eaten - so there's no need to dedicate a huge amount of space to housing beetles and incubating eggs. In terms of mealworm behaviours, here's something I've pondered for a while. It's pretty standard to feed fresh vegetables for moisture, and mealworms will swarm towards them and attach themselves as they feed. Their motion causes the whole thing to sink below the surface of their feed. The vegetables need to be changed out once in a while, and they can cause mould when they come into contact with dry food, so it's a bit of a pain. I'd love to be able to enclose the vegetables in something that would separate them from the feed and permit easy removal but still allow the worms to feed - maybe another mesh, big enough for their heads to fit through but nothing else? Being able to supply moisture in another, more contained and mold-resistant way would also be nice - maybe some kind of wicking fabric. What about a lid of a plastic container, you know, a flat piece of plastic to put the moisture food on? That works fine for a few trays, but might be a bit of a pain once you have thousands! Plus they can pull the food off, so you have to check from time to time. I guess a spike in the middle of the plastic could help keep it in place. We've done similar things with crickets, using a bit of foil as a food tray. Another approach would be to make sure they never have enough excess feed for it to spoil; only add exactly as much as they can eat. yeah, I think you could work out a dish with a lip around the edge to prevent them from pulling it off, and yeah, it might be a pain with lots of them. Maximizing yield of Tenebrio molitor mealworm larvae is affected by ratio of amino acids. Some negligible feed substrate aminos are uninfluental when lacking, others can limit weight gain. And then with absolutely none of any one of phenylalanine, threonine, valine, leucine,isoleucine, methionine, arginine, tryptophan or histadine the larvae will only gain a paltry bulk in 4 weeks. Another supplementation improving weight gain involves adding tyrosine, which then removes the necessity of pheylalanine being converted into tyrosine. so an alternative to adding more tyrosine is to increase the feed substrate's phenylalanie content by supplementing just feeding oats with some peanut meal, which (dry) has a high phenylalanie of 12 mg/gram. The amino ratios are complicated because of the biosynthesis transamination (aminos acids being made into other amino acids). Arginine supplementation also improves growth because otherwise it draws on alanine or proline to be formed; & again peanut meal is about 3% arginine by dry weight. Another consideration for supplementing with peanut meal is it's aspartic acid content of 27 mg/gram by dry weight; since oat has only 11 mg/gram. Both aspartic acid & alanine improve larval synthesis of purine/pyrimidine & optimizing aspartic acid in the diet provides ideal guanine (RNA/DNA purine) & cytosine (pyrimidine) content in larva for their growth rate. However if larval diet is high in glutamic acid (oat contains 38 mg/gram) the glutamic acid amino limits aspartic acid funtionality. Larva only need a slight amount of cystine to amplify the methionine benefit & once again peanut is relatively low in cystine while oats being quite rich in cystine - a reduction in cystine concentration is favorable. One further mealworm larval feed supplementary aid to consider is niacin (nicotinic acid) & this is found at a higher concentration in peanut than oat.